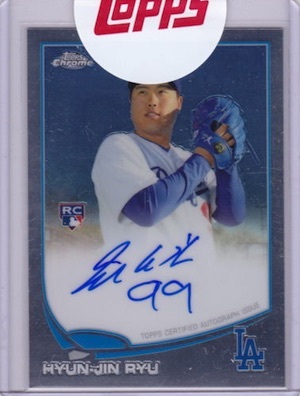 A dynamic South Korean pitcher who has struggled with injuries during his MLB career, Topps has provided an update for Hyun-Jin Ryu autograph redemptions in 2013 Topps Chrome. The rookie-year cards for Ryu have now been returned signed and collectors that received a replacement have the option to return those in exchange for their original Hyun-Jin Ryu redemption autograph. Collectors should also be sure to include their name, address, telephone number and the email address associated with the redemption account. 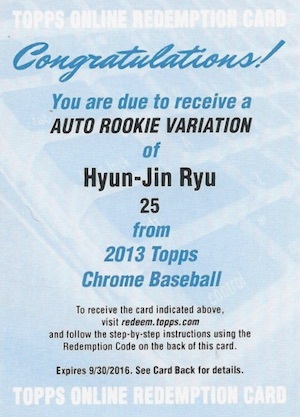 Returns must be postmarked by November 15 to receive the 2013 Topps Chrome Hyun-Jin Ryu Autograph. For specific help with your request, contact Topps by email (support@topps.com) or phone (1-800-489-9149). I wonder what the replacement cards were?? Maybe better this card – If the injuries keep him down.